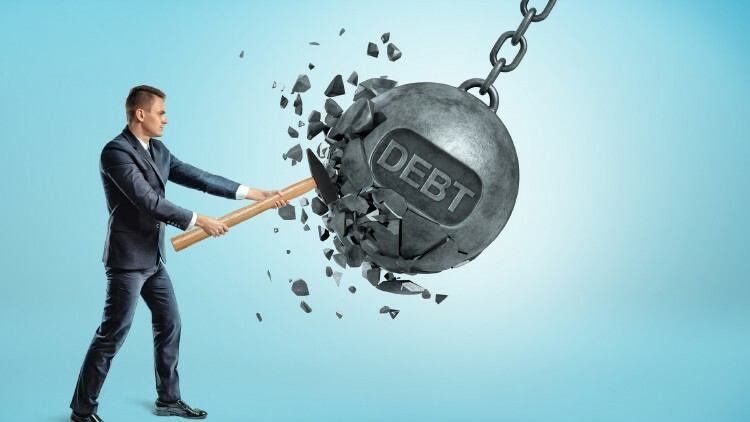 Effectively Paying Off Debt - Kattan Ferretti Financial L.P. Your credit card statement will indicate the amount of your current monthly minimum payment. To find the minimum payment factors, you will need to review terms in your credit card contract. These terms can change over time. For credit cards, the minimum payment is usually equal to the greater of a minimum percentage multiplied by the card’s balance (plus interest on the balance, in some cases) or some minimal amount (such as $15). For example, assume you have a credit card with a current balance of $2,000, an interest rate of 18%, a minimum percentage of 2% plus interest, and a minimum amount of $15. The initial minimum payment required would be $70 [greater of ($2,000 x 2%) + ($2,000 x (18% / 12)) or $15]. If you made only the minimum payment each month, it would take you 114 months to pay off the debt, and you would pay total interest of $1,314. Making payments in addition to your regular payments or the minimum payments can reduce the time payments must be made and the total interest paid. The additional payments could be made periodically, such as monthly, quarterly, or annually. For example, if you made monthly payments of $100 on the credit card debt above (the initial minimum payment was $70), it would take you only 24 months to pay off the debt, and you would pay total interest of just $396. As another example, let’s assume you have a current debt on which you owe $100,000, the interest rate is 7.125%, the monthly payment is $898, and you have a remaining term of 15 years and 3 months. If you make regular payments, you will pay total interest of $62,247. However, if you pay an additional $200 each month, it will take you only 11 years to pay off the debt, and you will pay total interest of just $44,364. Another strategy is to pay one-half of your regular monthly mortgage payment every two weeks. By the end of the year, you will have made 26 payments of one-half the monthly amount, or essentially 13 monthly payments. In other words, you will have made an extra monthly payment for the year. Furthermore, payments are made earlier than required, thus reducing the total interest you will have to pay. One way to potentially optimize payment of your debt is to first make the minimum payments required for each debt, and then allocate any remaining dollars to the debts with the highest interest rates. For example, let’s assume you have two debts, you owe $10,000 on each, and each has a monthly payment of $200. The interest rate for one debt is 8%; the interest rate for the other is 18%. If you make regular payments, it will take you 94 months until both debts are paid off, and you will pay total interest of $10,827. However, if you make monthly payments of $600, with the extra $200 paying off the debt with an 18% interest rate first, it will take you only 41 months to pay off the debts, and you will pay total interest of just $4,457. If you have multiple debts with high interest rates, it may be possible to pay off those debts by getting a debt consolidation loan. This type of loan will typically be a home equity loan. Therefore, the interest rate on it will often be much lower than the interest rates on the debts being consolidated. Furthermore, if you itemize deductions, interest paid on home equity debt of up to $100,000 is generally deductible for income tax purposes, thus reducing the effective interest rate on the debt consolidation loan even further. However, a home equity loan potentially puts your home at risk because it serves as collateral, and the lender could foreclose if you fail to repay. There also may be closing costs and other charges associated with the loan. All examples are hypothetical and for illustrative purposes only.